For tennis buffs, a relaxing vacation is the perfect time to practice your serve and refine your game, or simply enjoy a fun match with friends. 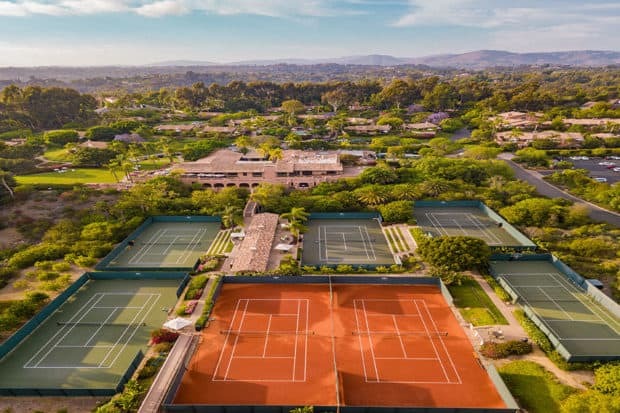 If you’re looking for the ultimate tennis getaway, these seven properties in the U.S. and beyond offer dozens of courts, on-site pros and expert-led clinics—plus year-round sunshine and spectacular settings that may make it impossible to leave the court. Contact Indagare to plan a customized tennis trip. This San Diego retreat, where each guest casita features vaulted ceilings, hand-painted tiles, indoor and outdoor fireplaces, a four-poster bed and a plunge pool, is known for its tennis and fitness programs, thanks to a staff of USPTA- and USPTR-certified tennis pros. 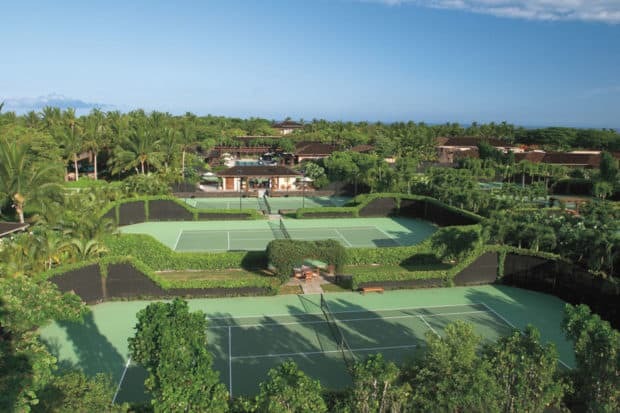 Its 18 tennis courts (16 Plexipave championship courts and two European red clay courts) are set against a scenic backdrop of bougainvillea and citrus groves. 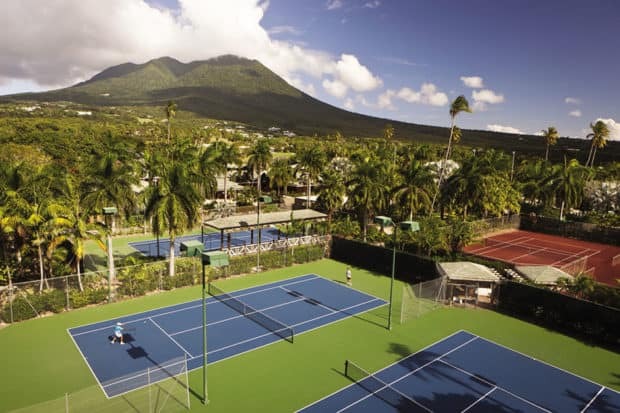 Considered among the top tennis destinations in the Caribbean, this family-friendly resort sprawls across hundreds of acres on Nevis’ west coast, spilling down to a beautiful four-mile beach. In addition to its three pools and 18-hole golf course, the Four Seasons features 10 courts (four red clay courts, four hard courts and two AstroTurf courts), five of which are equipped for night play. The hotel also offers a pro shop, player match-ups with other interested guests and staff instructors for private and group lessons. 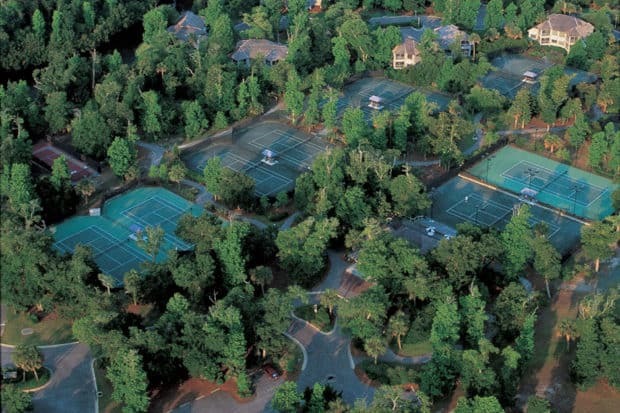 The Roy Barth Tennis Center at this South Carolina resort, located less than an hour’s drive from historic Charleston, continues to earn acclaim for its top-notch pros and 22 beautiful courts, including 19 Har-Tru courts and three hard courts, surrounded by lush foliage. 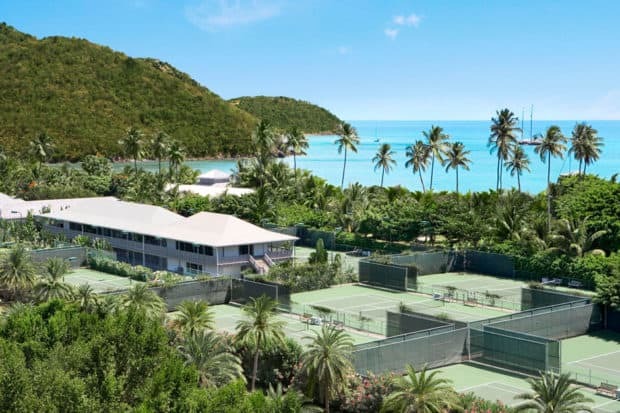 The resort offers multiple tennis packages for guests and an impressive roster of events throughout the week, from drill sessions to clinics focused specifically on forehands, backhands or serves. This resort in Palm Springs has hosted such legendary players as Pete Sampras, Novak Djokovic, Roger Federer and Maria Sharapova, and the excellent tennis center features both hard and clay courts, as well as classes led by USPTA-certified professionals. Formerly a dedicated tennis resort, Carlisle Bay in Antigua features a spectacular oceanfront location and 82 suites, most with sea views. The family-friendly property offers nine courts, including three floodlit courts, and complimentary tennis clinics each week. The ultimate luxury resort on Hawaii’s Big Island, the swanky Four Seasons complex is a destination in itself. In addition to multiple pools, a championship golf course and a beloved kids’ program, the resort includes eight Rebound Ace surface courts (with two lit for night play), a tennis shop and a staff of excellent coaches leading private lessons and daily clinics. There are also evening doubles mixers to meet fellow racquet-toting guests and a unique “Play the Pro” opportunity allowing guests to challenge a pro on the court—if you win the set, your court fees are waived. This famed California resort set on a bluff in Monterey may be best known for its location next to the top-rated public golf course in America (the storied Pebble Beach Golf Links), but its tennis program is equally impressive. Guests enjoy complimentary access to both The Beach & Tennis Club, with ten championship courts (8 Plexipave and two Har-Tru clay courts), and The Spanish Bay Club, with eight enclosed Plexipave tennis courts. Both facilities offer lessons, camps and clinics.